Volatility targeting is a sophisticated approach used by hedge funds to determine the amount of leverage that will be used. Volatility targeting is strongly related to trend following, since its most commonly used by commodity trading advisors (CTAs). It is a form of risk management applied at the level of the portfolio. The approach is closely related to equal volatility weighting and risk parity. On this page, we provide a simple definition of volatility targeting, give an example of volatility targeting, and discuss some of the advantages and disadvantages of using volatility targeting. Volatility targeting means that the manager will increase or decrease the amount of leverage to ensure that the volatility of the portfolio remains close to the target. As such, if the volatility goes up, he or she will scale down the portfolio. If the volatility goes down, the manager will take more leverage. The aim is to ensure that the amount of dollar risk remains the same. To perform volatility targeting, two elements are needed. The second element is the actual annualized volatility of the portfolio. This is the level of volatility of the unleveraged or unlevered portfolio. Or 1.92. This means that, for every dollar we invest, we need to borrow an additional $0.92 to ensure that the portfolio achieves the target volatility of 20% per year. The target volatility depends on the amount of risk that the investor is willing to take. 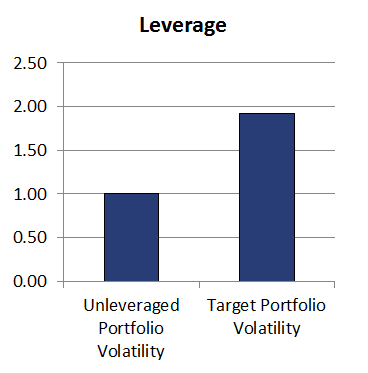 The more volatile the portfolio and the higher the amount of leverage used, the riskier the portfolio. We discussed a risk management technique called volatility targeting. It is often used by CTAs to ensure that the portfolio exhibits the level of volatility that is needed. The manager will periodically adjust the amount of leverage to ensure that the portfolio meets the level of target volatility.